Our plumbers, drain techs and HVAC technicians deliver Ship Shape Service. We’ve been taking care of families in the Silver Springs, Olney, Rockville and Bethesda, Maryland area for over 20 years. Customers say they’ll use us again and refer us to others. That’s because our plumbing, drain cleaning, heating and cooling repair technicians are clean, courteous, friendly, respectful and most of all, dedicated experts in their fields. Every job is done right the first time – we guarantee it! 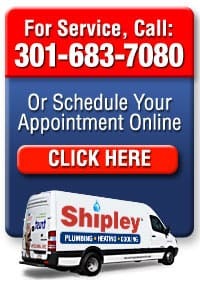 FAST, same day Montgomery and Howard County, Maryland plumbing, drain cleaning, heating and air conditioning service. Upfront pricing and clean, courteous technicians. Now that’s Ship Shape Service! Call and make an appointment that’s convenient for you. We’ll show up on time, listen to your needs, see what it is involved in your home plumbing, drain, heating or air project, make recommendations and prepare pricing by the job, not by the hour, so there are no surprises. We promise to take great care of your home. Our licensed plumbers, heating and air conditioning technicians wear shoe covers, put down drop cloths, are trained to perform the work you need and will thoroughly clean up the work area. We follow up with a phone call to be sure you are satisfied. We stand by everything we do. 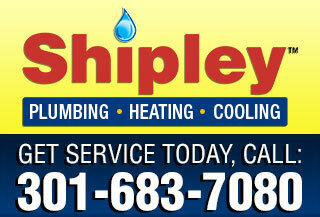 “1) Shipley really stands behind quality of their work. Building needed a gas pilot replacement on a very old furnace with hard to find parts. The first replacement part failed within one week. The owner himself got involved and ensured timely turnaround and a second service call was completed to our satisfaction. No charge for second visit. 2) Originally hired a major company with initials CM to do air conditioning maintenance. UV light failure diagnosis resulted in recommendation to replace the entire UV light system for $1600. Called Shipley and a technician came out who really knows diagnostics: analysis — a fixture fuse box failure. Shipley ordered the part, did installation — a fraction of the cost. 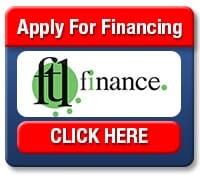 These guys are not about up-selling but providing quality service for a reasonable price. They are technically very competent in their respective areas of specialization — so the HVAC chap probably is not going to be dealing with a drain clearance issue (my only disappointment). That is hardly a downside when the technicians are rock solid.